Japan Can Now Send Its Military Abroad, But Will It? : Parallels For the first time since World War II, Japan's military can fight beyond its borders. The move sparked weeks of protests even though the likelihood of involvement in a foreign war appears quite small. Japan Can Now Send Its Military Abroad, But Will It? Demonstrators rally against Japanese Prime Minister Shinzo Abe's controversial security bills in front of the National Diet in Tokyo in September. The bills, which passed, will allow Japan to send its troops overseas for the first time since World War II. However, the likelihood of Japanese involvement in a foreign war appears quite small. For the first time since World War II, Japan can use its military beyond its own borders. This change in interpretation of the nation's Constitution proved highly unpopular, sparking weeks of demonstrations in Tokyo. "I didn't even care about what democracy looks like. I didn't even care. But now I realize, it actually matters," said Wakako Fukuda, a 20-year-old college student who demonstrated for days against controversial security bills eventually passed by Prime Minister Shinzo Abe's ruling party. The bills allow for Japan's armed forces to help defend its allies, like America, even if Japan itself isn't under attack. The Japanese Constitution — following devastation from the war — previously limited Japan's forces to self-defense within its own borders. "That's the thing which has been protecting us from not killing us or doing anything that could be harmful for other countries. That's the proof that we actually learned from our mistakes," Fukuda said. While the measures brought Fukuda and tens of thousands of other protesters to the streets, the likelihood that Japan will actually send troops into combat overseas is probably quite small. "It was portrayed both by supporters and opponents of the legislation as being a major transformation of Japanese national security policy, which it isn't," says Robert Dujarric, head of the Contemporary Asian Studies Institute at Tokyo's Temple University. It's true the legislation drew passion from both sides. Legal scholars, like former Japanese Supreme Court Justice Kunio Hanada, don't like the way leaders pushed the changes through the process, since 70 percent of Japanese voters polled said they saw no need to pass the security bills this session. "This abnormal action was taken at the Cabinet level of the government itself without the full explanation or understanding or support of the nation as a whole," Hanada said. But Prime Minister Abe argues that giving Japanese forces more flexibility would help deter war. "We need to be prepared to meet every possible security challenge," Abe said, suggesting as examples threats from North Korea. Dujarric says the controversy is much ado about very little. He argues that just because Japan now has the option to militarily protect allies abroad doesn't mean leaders have the will. Furthermore, the Japanese population is gray and getting grayer, and, if you follow the money, it's clear Japanese defense spending is still small. "Even though the security environment in East Asia, from a Japanese point of view, is considerably worse than it was 15 years ago, Japan is not devoting significantly larger proportions of its national income to defending the country," Dujarric says. 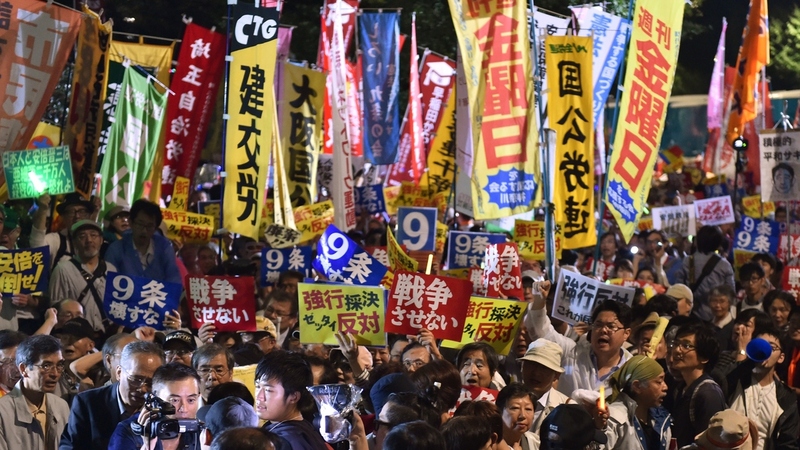 Opponents, like Fukuda, pledge to keep up their demonstrations, despite the passage of the security bills. Chie Kobayashi contributed reporting for this story. For a behind-the-scenes look at our Japan and Korea coverage, check out our East Asia Tumblr, Elise Goes East. In the audio of this story, as in a previous Web version, the recently passed security bills are referred to as a "change to the ... Constitution." The bills changed the interpretation of the Japanese Constitution, not the actual text.